We've all experienced the misfortune of dropping a phone. Some of us have even taken that bad experience a step further, by not only dropping the phone, but having it end up in a puddle/pool of water. At that point, there's little hope of its survival. Let's all have a moment of silence for devices who've met their tragic fate by being dropped. If you own a Galaxy S III and cringe at the thought of losing your beloved device in such a manner, there's hope: the new OBEX case from Seidio. This thing's a beast, actually - it's dustproof, impact-proof, and waterproof. If you break your device with all that protection, there's probably no hope for you. I got to check out the OBEX at the Big Android BBQ this past weekend, and it's a lot sleeker than you may expect for such a protective case. The Seidio guys had the OBEX on display all day long with a GSIII playing videos in a fish tank full of water. Like a boss. The OBEX consists of two parts: a waterproof membrane (which protects all ports), and a durable hardshell outer layer. This combination keep the GSIII safe for drops up to six feet and allows it to be submerged under 2 meters of water for up to 30 minutes. The OBEX case is available now for $80, with a combo that includes the belt-clip available for $90 in the coming weeks. 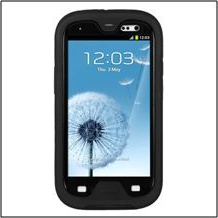 HOUSTON--(BUSINESS WIRE)--Seidio, a leading manufacturer of premium mobile technology accessories, begins shipping the highly anticipated OBEX case for the Samsung Galaxy S III. Designed as the ultimate protection against drops and external elements like water, snow, mud, dust and sand, the OBEX (Latin for “Barrier”) ensures the safety of your device. Seidio’s newest case exceeds the IP68 rating which means it is both dust-tight and protected against complete, continuous submersion for 30 minutes in 2 meters deep water. Waterproof membranes guarantee external matter will not be able to penetrate the phone’s speakers or microphone without losing sound quality. Meanwhile, the built-in screen protector promotes touch sensitivity and clarity, and anti-reflection glass protects the camera lens without interfering with photo quality. It’s happened to all smartphone owners at some point: that dreaded moment when the device falls to the ground. 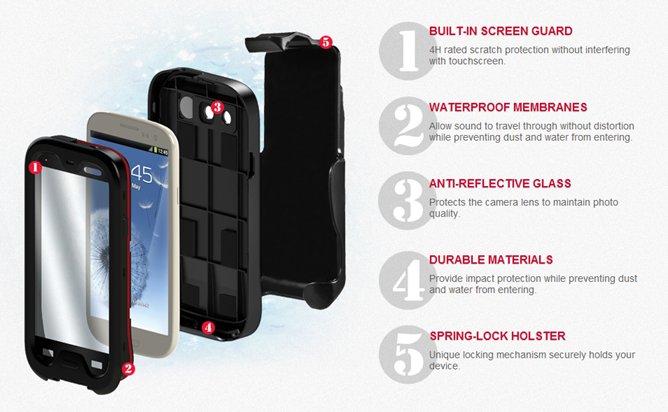 The OBEX guarantees the safety of the Galaxy S III against most drops. It has far exceeded the military requirements set forth by the MIL-STD-810G test which evaluates the case from 6-foot drops at multiple angles. This is due to the unique combination of Polycarbonate and Thermoplastic Polyurethane materials used to build the case. Galaxy S III owners do not need to trade functionality for protection. With the OBEX, users can enjoy the high level of protection while enjoying a fully functional phone. The case will not interfere with radio signals, Bluetooth, or NFC (near field communication). Also, the rubber silicone stoppers used to keep dust and water out of important ports are easily removable. The OBEX retails for $79.95. It is available at www.seidio.com/obex. Seidio will also release the OBEX Combo for $89.95 in the coming weeks.